CS-Cart Responsive Theme - Timer : CS-Cart Timer Responsive Theme simply makes the difference having a unique and clean responsive design for CS-Cart and CS-Cart Multivendor stores. A website with responsive web design is able to adapt to the screen size it is being used on, regardless of what device it is. The website automatically adjusts its content to give the users a better experience that is well suited to their device. 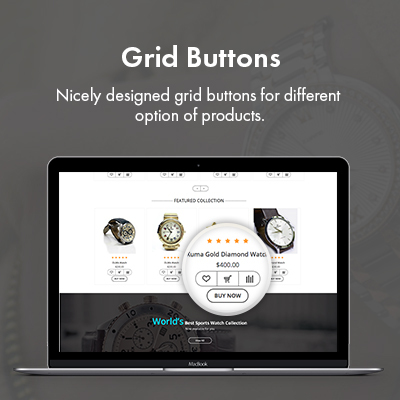 You can use this theme for absolutely any type of store selling products like watches, clocks, electronics gadgets etc. CS-Cart Responsive Theme - Timer:Bored with the default themes of the store!!! Enhance the look and feel of your CS-Cart store with CS-Cart Responsive Timer Theme. CS-Cart Responsive Theme : Timer simply makes the difference having a unique and clean responsive design for CS-Cart and CS-Cart Multivendor stores. A website with responsive web design is able to adapt to the screen size it is being used on, regardless of what device it is. The website automatically adjusts its content to give the users a better experience that is well suited to their device. 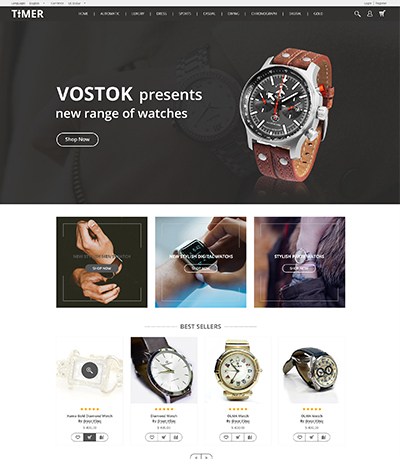 You can use CS-Cart Responsive Theme: Timer for absolutely any type of store selling products like watches, clocks, electronics gadgets etc. Timer theme works with every type of screen resolution. The theme will adjust the store layout according to the viewing device. The theme will look amazing on any type of device. A completely new design for your CS-Cart store. Practically, with no programming knowledge, you can change your store look anytime you want. In terms of statistics, you have 3 seconds to make a new user stay on your site after landed on any page of your site. The way your store looks is also a part of the things needed to make them stay. The Timer home page shows various banners, products, and categories. The store owner can customize the layout of the homepage using blocks and widgets from the back-end. 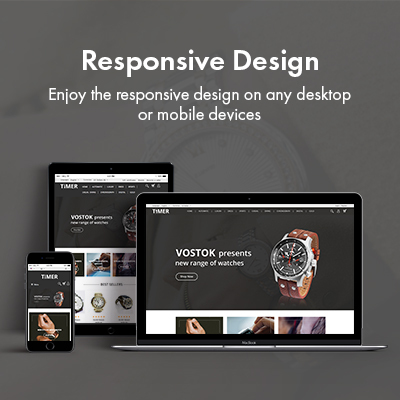 Did you buy CS-Cart Responsive Theme : Timer?